Me. Katy Dial. The world's biggest arachophobe - who can't even look at, let alone touch, a teeny tiny house spider - held a HUGE, REAL LIFE tarantula. This completely unexpected and out-of-the-blue experience took place a couple of weeks ago, when Daisy and I spent the day as VIPs at Paradise Wildlife Park, in Broxborne, north of London, just off the M25. We had a brilliant day out; the park is really easily accessible by both car and public transport, and it's packed full of family-friendly amenities. We had a lovely day seeing all the animals, running around in the wonderful play areas and watching the Karizma Kidz entertainment show. As guests of the park we were also treated to a lovely slap up lunch! It was after said lunch that my darling daughter asked our friendly guide whether she could hold one of their tarantulas. This was NOT part of the itinerary but of course the lovely staff were happy to oblige. Daisy may be a pink princess, but she's a bare footed, mud splattered, tree climbing pink princess, and one of her all time favourite things to do is to go bug hunting. Worms, beetles, woodlice, snails - you name it, we've had one as a pet at some point. 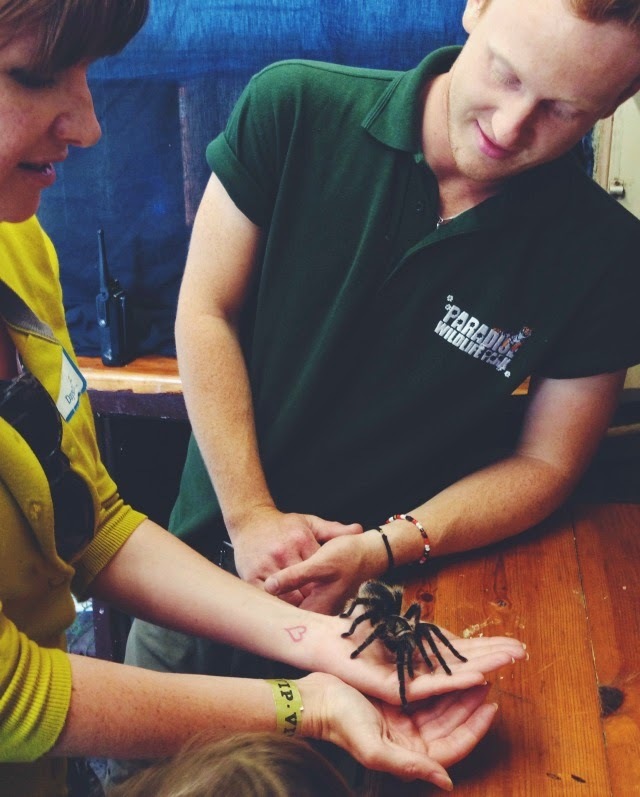 Paradise have lots of different experiences on offer, one of which is their very popular Face Your Phobia Experience. Under the supervision of a highly experienced keeper and in a very safe environment, its the perfect chance to learn about, and handle, whichever creepy crawly it is that you're afraid of. As our guide walked us over to the reptile house, my knees were properly buckling... And I wasn't even going to be holding one! I'm still shocked at how brave my biggest daughter was; when they got the tarantula out she didn't flinch - she held it super carefully and smiled the whole time. I, on the other hand, thought I was going to vomit! When she said 'your turn, Mummy' I was about to make my excuses and leave, but how could show myself up in front of my four year old? I honestly don't know what possessed me, or what I said to the keeper, but the next thing I knew, I had a bloody great tarantula on my hand. I think my facial expression says it all! DISCLAIMER: We were invited to Paradise Wildlife Park by DaysOut.co.uk; a brilliant website dedicated to promoting attractions throughout the UK and providing entrance to them at discounted rates. If you're planning a day out, definitely check their website before you go anywhere!